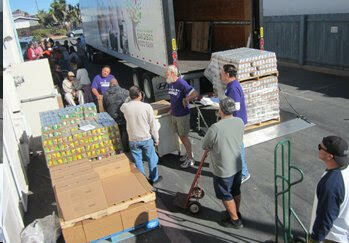 You Can Make a Difference Helping the Hungry in Imperial Beach. The 200 Society Seeks to Do All the Good We Can Together. Working to end hunger and homelessness in Imperial Beach is the aim of the Imperial Beach United Methodist Church. And the church is now looking for partners to make that possible. 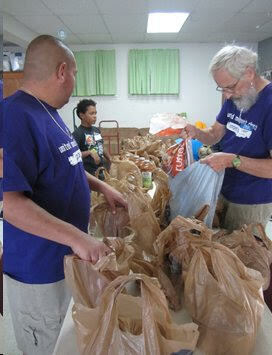 What is happening: Every Tuesday and Thursday from 9-11am, the church helps approximately 1,600 people with food. Every Saturday from 7-9am, showers, clothes, toiletries and sack lunches are provided for the homeless. For two weeks in the year, the church hosts twelve homeless individuals through the Interfaith Shelter program. The church has started two collaborative efforts addressing homelessness and hunger in Imperial Beach. (The Hunger Collaborative meets at YMCA: Camp Surf on the second Wednesday of the month at 9am and The Homeless Collaborative meets at the IB United Methodist Church office on the first Friday of the month at 10am; all interested can attend.) Occasional nutrition classes and cooking courses are offered at the church. And the church has a Community Garden where individuals can plant and harvest fresh vegetables. Beyond these programs, the church offers free professional counseling by appointment and free tax preparation for those with low incomes. All these programs emerged from a compassion for the people of this community. The church wants to ensure the continuation and expansion of these programs, but needs the support of the larger community. Together as a community, we can do great and amazing things. How You Can Help: To work towards doing all the good we can in building a healthier community, the 200 Society is created. This is a group of individuals who will give, at least, $20 a month or $240 a year. All donations are tax deductible. Those in the 200 Society will receive quarterly updates about the various programs. And members will be invited to a special annual gathering to discuss the programs and offer input to improve and expand the outreach efforts. To become part of the 200 Society movement, checks can be made to Imperial Beach United Methodist Church (455 Palm Avenue, Imperial Beach, CA 91932) or made online at www.gofundme.com/ibhunger.